This spectacular oceanfront house sits on two acres and overlooks peaceful McFarland’s Cove, Johns Bay, and the Atlantic Ocean. The location is beautiful and idyllic. It’s located in the heart of New England’s most picturesque region, mid-coast Maine, and includes all the essentials to delight the senses: the smell of fresh sea air, the sounds of the lobster boats hauling in their catch, the taste of fresh seafood and local produce, and the lovely sunrise and sunset views enjoyed from the large porch overlooking the bay. From spring flowers to fall foliage, the area is serene and peaceful. The house itself is unique and classic. It has exposed wood throughout, pine floors, a nice open floor plan which combines the living and dining rooms, and a fireplace to gather around at night. Outside, a large porch with rocking chairs and a wicker seating area provides a perfect spot to soak in the stunning views. Other features include Adirondack chairs, a fire pit, picnic tables, and a private dock (perfect for swimming and fishing) and mooring. A spacious lawn in the front allows for fun and games. Although the house is a classic Maine oceanfront cottage, everything is brand new including all the appliances, all the beds (high-end Serta hotel beds), the linens (300+ thread count), the down blankets, the TV (a 39” HD flat screen with DirecTV), the DVD player with a movie library, and a fully furnished chef’s kitchen. We also have high speed wireless internet access. The house has five bedrooms and sleeps 12 comfortably (one king, three queens, and one large bedroom with four XL single beds). Island Grocer, a gourmet shop/deli, is two minutes down the road so you never have to worry about getting your morning latte with the daily New York Times. Additionally, there are many great restaurants minutes away. • Pemaquid Lighthouse – perhaps the most photographed lighthouse in the U.S.
CONCIERGE service available. Please ask for details. John and Susan Holbrook have four daughters and own an educational tour and travel company in North Carolina. Every summer since 1973 our extended family has made the annual pilgramige to this very special place, McFarlands Cove, in South Bristol,Maine. Our family has grown in size over the years and I felt it was neccessary to acquire the adjacent property to the one that has been so special to us for so long. I rented this property last summer and loved it so much I purchased it as soon as I discovered that it was on the market. The fishing is outstanding right off of the dock ! Brand new appliances with a full chef's kitchen! Expansive water view from spacious porch. Have rocking chairs and wicker seating area. Also have a screened porch with dining table/chairs facing water. Spring water delivery, Firewood provided, and garbage removal included. Phone and high-speed wireless internet service included. 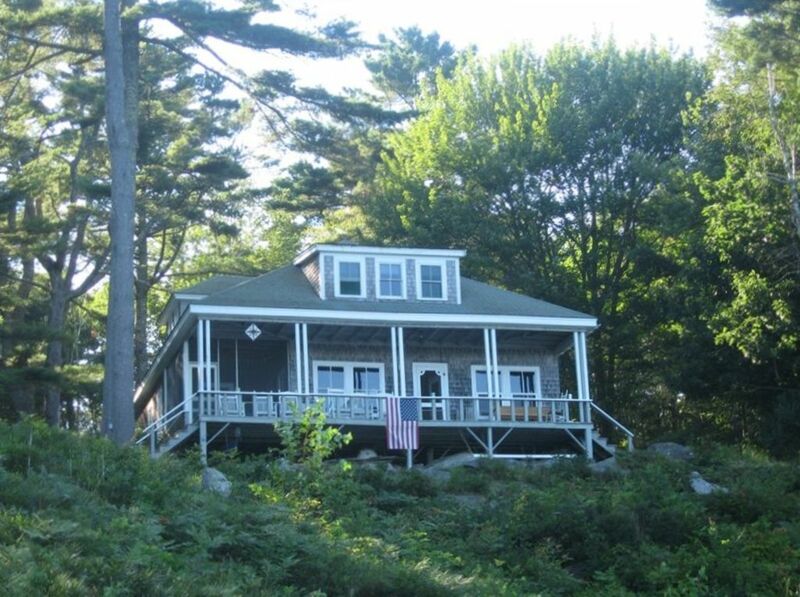 I can't imagine a better Maine experience; a well appointed classical cottage in a quiet private cove with dock and just minutes from the village of South Bristol. The house is wonderful. A well maintained historic, rustic style cottage upgraded to embrace an open plan and all the modern amenities. The view from the porch is spectacular and I never got tired of sitting in one of the rocking chairs and gazing over it as I read my book. I spent a week here with my family and my sister's family, which included our adult children. It has five bedrooms, most with queen beds, and a large dining table that seats ten. It is hard to find a house that will accommodate a larger party, all of whom are adults and don't fit comfortably in twin beds. We were able to keep our boat at the dock and also to fish from it, and there are picnic tables and a fire pit for outdoor entertaining. The house was very clean and comfortably furnished. I couldn't have asked for more. We had a fabulous week; I didn't want to leave! The Holbrooks were great hosts and saw to our every need. This is our 2nd year renting the cottage for our full family vacation. We have 12 people and all had space and plenty of room to relax, read, nap, play games and enjoy the water. It is quite warm & stuffy upstairs, but recent additions of fans and window fans have helped. For us it was not an issue as we preferred being outside on porch, deck, boat or dock during day. The paths to dock are steep, so we got good workouts everyday. I would not advise these paths for older folks who don’t feel able bodied. There is a fire pit we enjoyed many evenings and plenty of cards, games and puzzles available for rainy days, should they happen. The owner was truly hospitable, available, easy to reach and eager to offer any comforts or solve any problems we had. He allowed us use of canoe, kayaks, safety flotations and fishing gear. We have a harder time leaving this place every time we rent here! This is one-of-a-kind place. It is peaceful. The view is magnificent. We had a family reunion there (12). We swam, kayaked, fished, and enjoyed the camp fire in the evenings. The location is beautiful. The cabin is rustic but spacious and well appointed. Ours was a late October stay and the foliage was amazing. A large home for the two of us but we found it very cosy. There was a nice fireplace with plenty of wood for chilly evenings plus a large propane heater for chilly early mornings. The kitchen was extremely well-equipped - cuisinart pots and pans, several cast iron pans, great sharp knives, mixer, blender, toaster, griddle. Also plenty of bottled water as well water has a “taste”. Probably the only thing I missed was a Keurig coffee machine. Large fridge, great convection oven with cooktop and a dishwasher. The King bed was very comfortable and the comforter kept us warm at night. The amazing sunrise lit up our room and was breathtaking. The house is very comfortably furnished with room for lots of people. 3 BRs upstairs sleep 8 and bathroom w/shower. 2BR downstairs and bathroom with great claw foot bathtub equipped w/shower and a heater! Great private dock for fishing and the porch with 6 rockers was where we spent a lot of time watching the birds - saw a bald eagle several times, boats and overall beautiful views. We hiked several beautiful well maintained trails and even with many places closed for the season we found and ate many a lobster, mussels and clams nearby. The town of Damariscotta was fun to visit and restaurants and shops were open. One rainy day we drove to LL Bean to shop & visit Freeport stores. We had little cell service in the house (AT&T) which was actually pleasant. There was WiFi & Direct tv but we spent more time reading and relaxing - which was the point of our trip. We highly recommend this beautiful warm well appointed home with beautiful landscaping and hope to find our way back again soon. The Owner, John, was also very helpful & available by text or phone for any questions we had. Clearly they love their home in Maine and it shows! Don't tell anybody about this place, it's awesome! Not sure where to begin, but the house, the location, the views, the scenery, the food were all spectacular. A great place to see Maine. Hard to beat a 10 drive to get fresh lobster from the coop, or if you're lucky, flag down a lobsterman checking his traps and buy them right off the boat! Plenty of things to do, but also a great place to not do lots of things and just plain relax and unwind. Sit on the porch in a rocking chair and watch the Osprey and the occaisional Eagle perch in the trees right in front of you. The house and furnishings are great. Everything you need is there for cooking. Grocery shopping is 20 minutes away. The house and property was exactly as described. There was plenty room for all of us, my husband and myself, our four adult kids and their spouses, girlfriends, as well as our granddaughter and a close family friend. We fished, and hiked, and biked, and walked, and toured Pemaquid lighthouse. We cooked and ate, and sat by the fire, both outside and in. We slept in cozy beds at night, and shared a huge lobster feast together around the huge dining table. We can't wait to go back and do it again! What a beautiful spot!! Rates vary seasonally from $2000/wk to $3500wk. Rates are based on a maximum of 10 guests. The cottage sleeps up to 12 guests.